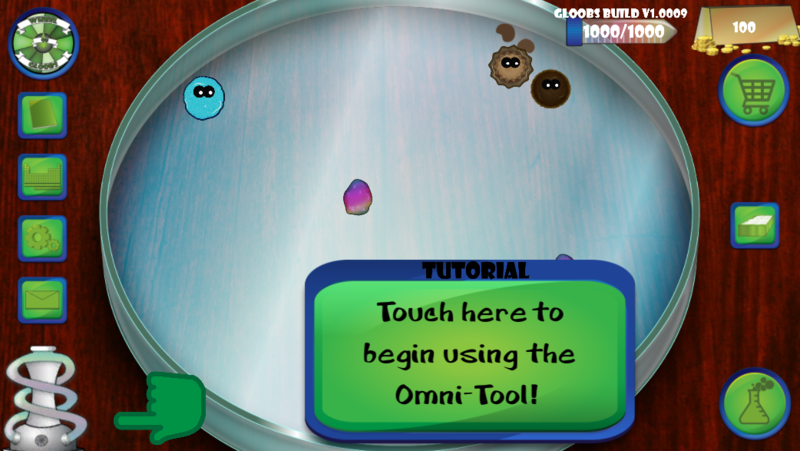 Gloobs is a game where science meets fiction and the player is creating and molding life itself. The player, a scientist working for Über Technology, will take Gloob Experimentation Liquid (GEL) found at the landing sight of an alien being and conduct experiments on the GEL. These experiments can bring the Gel to life and give it many different combinations, attributes, and even behaviors! The player's goal of this game is to discover every possible gloob by trial and error, discovering all the interesting quirks of the gloobs as they progress. When the player discovers enough gloobs, they will be able to spend the Gel that they create in the gloob-making process. The can spend their earnings on new tools to use on the gloobs, other machines to use in the lab, and even different items that will allow them to customize their lab. Gloobs is the Premier Game Project for Lantern Light Studios LLC. The game started as a concept made by the founders of Lantern Light while taking a class at Ohio University. I worked on the project from July of 2015 until January of 2016. I had to leave Lantern Light due to other projects being priorities. The concept of gloobs left us with a really open playing field as far as where we wanted to take out game. We looked at how we wanted different gloobs to have different attributes and elemental characteristics. We looked at some older games with similar mechanics for direction, pitfalls, and other things that could help us produce a top notch game. One of these inspirations was a game called Doodle God by JoyBits. This game inspired us to have the idea to fuze two gloobs into one brand new gloob as opposed to just using tools on the gloobs. The Art and animation team for gloobs took the different designs and elements and crafted them into the cute little guys you see here. Each one falls under a tiered tree of progress that allows the player to tackle a small bunch of gloobs at a time. The designs vary greatly, from something as simple as a water gloob, to something as specific as the Slasher gloob. To the left is a small chunk of the many gloobs that will be in the game.